UNI student body president Katie Evans talks to legislators. Student leaders at the state’s three public universities are asking for expansion of mental health counseling services on the campuses in Ames, Cedar Falls and Iowa City. Katie Evans, the president of Northern Iowa Student Government, says two UNI students committed suicide last semester and a recent UNI graduate she knew committed suicide in December. “Some legislatures across the country are beginning to make a priority of mental health and hopefully Iowa will follow along,” says Evans, who is from Dubuque. 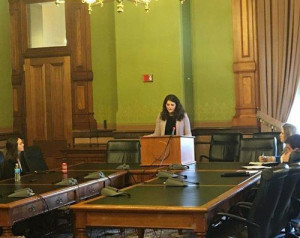 University of Iowa student body president Elizabeth Mills of Johnston got mental health counseling on campus during her first two years at the universities. Josh Schoenfeld, a fifth year medical student at the University of Iowa, is president of the student government for graduate and professional students on the Iowa City campus. He says depression is even more prevalent among graduate-level students than undergrads. “I personally have known three students who have committed suicide during my four years on campus,” Schoenfeld says. 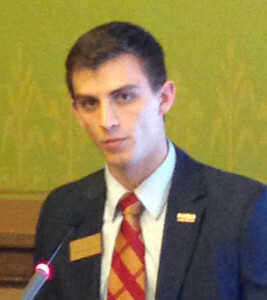 ISU student body president Daniel Breitbarth. Iowa State University student body president Daniel Breitbarth of Saylorville says the stress of “an astounding amount” of student debt is taking a toll. The student leaders made their comments during a statehouse news conference this afternoon.